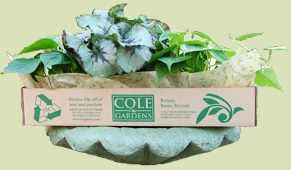 Recieve 10¢ off your next purchase for every box returned to Cole Gardens in reusable condition. Looking for Earth Friendly plant care products? We have made the selection easy for you with our new Earth Friendly sticker. Look for this sticker on products that have either natural or organic ingredients. We made it easy to point out safe products for your home. Note :We always recommend reading the label before applying.